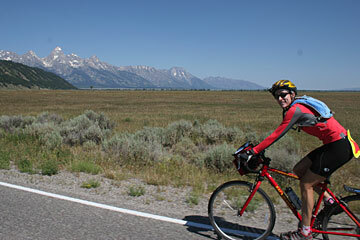 The author bikes through Grand Teton National Park on a multisport Backroads trip that also included Yellowstone National Park last summer. At home in Rye, N.Y., Robbie Howard was building a $22 million house for a client. But on this day in a campground in Yellowstone National Park, the developer was in charge of laundry. He emerged from his tent, borrowed a rope and rigged a clothesline for fellow campers grateful to wash a few garments in the nearest sink and hang them out to dry. Prices: Six day/five night camping trips for summer 2007 start at $1,598 per person, double occupancy. Discounts for children under 17. » Pillow: Don't go bulky, but don't skimp either. » Chamois towel: The extra-large size from REI was popular. » Bike shorts: If your kids whine about the dorky look, force them to wear bike shorts under their basketball shorts, which is what my 14-year-old son did. Kids who didn't were miserable. » Sunglasses: They become part of your safety gear on the bike. 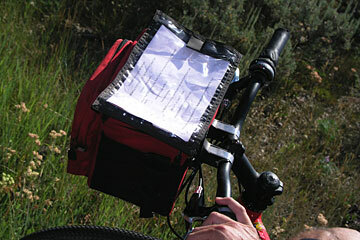 » Sunscreen and bug spray: The Backroads crew is always prepared if you forget. » Small hotel shampoos: Get one for each member of your family. Transferring one large bottle is awkward in the gender specific pay shower stalls at Yellowstone National Park. » Liquid detergent: To wash clothes in the sink or in pay washers. The guides always had coins. » Lightweight day pack: Keep a few necessities with you when your luggage is packed away: Even better, you can leave it the van -- always secured with a guide watching it -- while you ride your bike. » Flashlights: The lightweight Brookstone head lamp is even better, as the tent can get very dark. » Extra batteries: For your flashlight and camera. » Extra cash: To tip the guides at the end of the trip. It's difficult to say what was most intriguing about the Backroads family multisport camping trip my children and I took in July to Yellowstone and Grand Teton National Parks: rainbows emanating from waterfalls, bison ambling across the road in front of us, plentiful exercise that made every meal taste like a James Beard affair or the warm camaraderie that quickly developed among the participants in the rustic environment. For a long time I had wanted to show my two children these national parks in Wyoming and Idaho. Yet I wondered about an appropriate and safe way to travel as a single parent, especially when I'm not fond of experiencing nature from behind the wheel of a car. Backroads is a company that has coordinated upscale outdoor adventures around the world for more than 26 years. 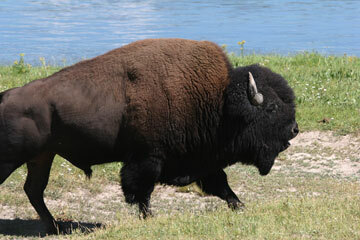 They offer travel itineraries in 16 U.S. National Parks, and host 14,000 singles, couples and family travelers annually. Carol Ai May, vice president and co-owner of City Mill in Honolulu, took four family travel trips with Backroads when she was a single parent. "It gave my kids confidence; it gave me confidence," said Ai May, who rode a stationary bike to prepare for the excursions. "It gave us one more thing we could do together. And the neat thing was, there was a destination and a goal and an accomplishment every day, so the kids were not whining. It just sort of bonded the whole group." Jennifer Howard, a kitchen designer from New York, agreed. "It's just so out of my routine, so out of my control," she said one evening during our trip. "I can follow; I don't have to be a leader. I'm relaxed. I'm trying different things. And I'm exercising." LIKE A FEW others in our group of 18, I was moderately anxious about camping for five nights with my children, ages 14 and 12. I don't mind bucolic, but I have a certain affinity for a shower and a bed at the end of a long day. I soon discovered there's a reason why it's called "deluxe camping." When we returned from bike riding or hiking, our luggage was inside our tents. Pupus were waiting in a campground filled with the comforting scents and sounds of other people preparing dinner. In the morning, our job entailed preparing a day pack and throwing the rest of our things in a our duffel bags -- after relaxing over coffee, fruit, yogurt, oatmeal and pancakes. "This is, like, not camping," said 12-year-old Kristin Davis of Georgia. "When I think of camping, I think of grime and dirt and trying to set up your own tent and not being able to. But this is nice. They set up your tent for you." My daughter, who had initially crinkled her nose at the notion of sleeping on -- or even near -- the ground, finished the trip a changed adolescent. Her favorite parts included "being with everyone, and having them cook food for us." But she also appreciated "not worrying about transportation, or what bike you're going to use, or who you're going to play with. You can just go along with the schedule and make suggestions." Camping was the best thing we could have done. Not only was the trip significantly less expensive than the casual and premiere inn journeys (which did look mighty inviting, however), it changed the dynamics of the group. Instead of retiring to individual rooms after the daily bike ride or hike, everyone gathered at the picnic table for wine, pita bread and sun-dried tomato hummus in the evening -- in jeans and T-shirts (or in Robbie Howard's case, a pair of pajama bottoms that would allow him to slip right into his sleeping bag after dinner). Without television, the kids created their own fun with riddles, stories and a deck of cards. A raucous four square tournament emerged from a ball and a piece of chalk. "I think it's better for the kids, to tell you the truth," said Gwen Davis, an anesthesiologist from Georgia. Her husband Don, an anesthesiologist with a Ph.D. added, "A lot more memories are made on a camping trip." Friends, too. By the second morning all of the kids, ages 9 to 15, piled into one van, and the parents into the other. The experience allowed us to share unique one-on-one time with our children in a kayak, biking beside a herd of bison or hiking. But it also provided adults with refreshing breaks for mature conversation. One evening, the guides took the younger set out for pizza, and left the adults to their fajitas and a large cast-iron tub of margaritas. When the van full of our beloved children returned, the group of devoted parents moaned amiably, reluctant to relinquish the freedom we never thought we'd experience on a family vacation. Bison were plentiful in Yellowstone. 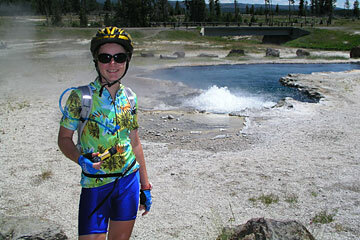 Alison Nichols, 11, takes a break in front of a bubbling hot spring in Yellowstone. MULTISPORT TRIPS are a good choice for families because there's plenty of variety and nobody needs to be a cyclist to enjoy them. My children, along with several others in our group, had not spent much time on bicycles before the trip, and did well. Fifteen-year-old Jacob Borman, a cross-country runner in Alabama, said, "(The activity level) seems like a lot, but it really isn't." Still, he added, "you should definitely be in some kind of shape to do this." Before the vacation begins, participants choose the type of Cannondale bike they want. Drop handle bars? Toe clips? Something more basic? On the first day, guides help adjust the bike, and distribute detailed instructions for the day's ride. At intervals, the van is available to pick up tired cyclists. Multiple rest points also provide opportunities to refill water bottles and snack on an ample supply of granola bars and fruit. Itineraries and distances vary. But the most enjoyable days occurred when there was one choice for everyone. Our free day to spend fishing or hiking with family sounded exhilarating, but turned out to be a mild disappointment. Possibly because the now-cohesive group scattered, and we parents were forced to plan and execute activities and manage our own children for the first time in four days. We had become accustomed to allowing four charming twenty-somethings lead us through our vacation. Letting young, energetic experts manage your trip is almost as pleasant as the breezy planning process. "In 45 minutes you can book your trip and your flight, and you know things are going to be taken care of right," said Nancy Borman, a member of our group on her fifth Backroads trip. Our first day took us on a fairly hilly 17-mile bike ride from our campground in Yellowstone along Firehole River, past an elk bathing in a rushing river and geothermal activity in the form of bubbling mud pits to our final destination: Old Faithful's trusty eruption. Amid young, sprouting trees, miles of charred logs recalled the 1988 fire that devastated much of the park. A 9.3 mile hike (less than three miles for the kids) the next day followed trails through the Grand Canyon of Yellowstone to the 308-foot drop of the Lower Falls of Yellowstone River. In the 4,000-feet wide canyon, condensation ran in rivulets down walls streaked the color of rust. Kayaking on aqua Yellowstone Lake occupied several hours the following day. With the water temperatures hovering at 55-degrees and bald eagles soaring overhead, it was easy to forget we were gliding over a dormant caldera. Covering 136 square miles, it is the country's largest natural lake measuring more than 7,000 feet. 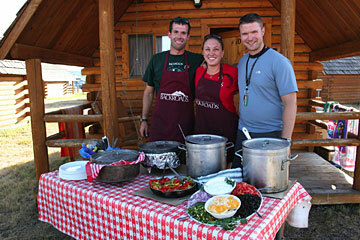 Three of the four guides present dinner for the group of 18 adults and children. 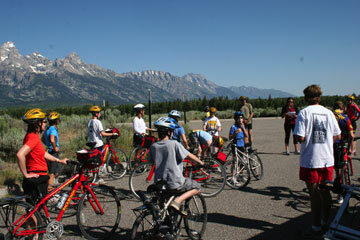 The group gathered for instructions before a ride in Grand Teton National Park. Midway through our paddling adventure, we stopped at a remote beach to find an impressive buffet lunch that somehow had emerged from a guide's kayak. Their ability to transform average food into the most appetizing sight you think you've ever seen almost ceased to amaze us because they did it so gracefully at every meal. Tablecloths and lilies on the picnic tables in the campsite? Homemade coffee cake with eggs, potatoes and pancakes for breakfast? Fajitas with chicken, beef, or the fish caught by members of the group that day, along with freshly made salsa and guacamole? Or maybe salmon, salad and tomato bisque soup? Trail mix goodies to fill a Ziploc back before every excursion so you wouldn't -- heaven forbid -- feel hungry for more than 30 seconds? "The meals are not five-star restaurant, but it's definitely upscale," said Don Davis. And healthy. This is one reason why Backroads isn't cheap. But the value is in the details, and in the 200 to 300 trip leaders they carefully screen and train. They are all college graduates, knowledgeable about the area, accommodating, polite, flexible and "young, hip, funny and very organized," Ai May recalled. No wonder the kids loved them. On the day our route took us nearly 40 miles through Grand Teton National Park, the van met the kids after about 14 miles. The guides took them to a park and made sure they had plenty of water and sunscreen. After a water gun fight in Jackson Hole, Wyo., they played running games until the adults finished riding and had a chance to shop. Grand Teton National Park gets less recognition than Yellowstone, and it's evident in the somewhat tired public restrooms and roads. But all of that was quickly forgotten when we biked past the jagged, snow-capped peaks that attract outdoorsmen who never leave. Its lack of summer crowds and rural charm made it a surprise hit with all of us. The last day was, quite simply, too short. A 14-mile bike ride over rolling hills to Jenny Lake led us to a boat ride along the base of the imposing Tetons. Before lunch, we enjoyed a hike to a waterfall, and a few in our group even spotted a grizzly bear. After we returned home, my children and I began searching the Web for our next Backroads trip. Would we venture to Maine or France's Loire Valley? Perhaps New Zealand or Zion National Park? No matter what we decided, we knew we would make new friends, see a part of the world that might otherwise pass us by and create lasting memories. 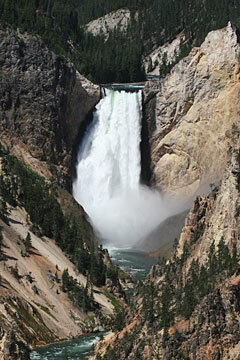 A waterfall in the Grand Canyon of Yellowstone tumbles 308 feet. Detailed maps and instructions give people the freedom to go their own pace. 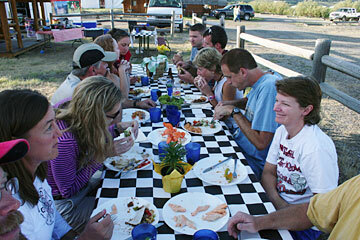 Meals on Backroads camping trips are communal and casual. Katherine Nichols is a Star-Bulletin feature writer.